Is í an Dr Eithne Ní Ghallchobhair údar Enjoy irish. Is as Ard an Rátha di agus tá sí ag obair in Acadamh Ríoga na hÉireann mar eagarthóir cúnta ar Foclóir na Nua-Ghaeilge. Is ball í d’fhoireann teagaisc Oideas Gael. 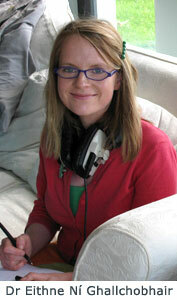 Dr Eithne Ní Ghallchobhair is the author of Enjoy Irish. 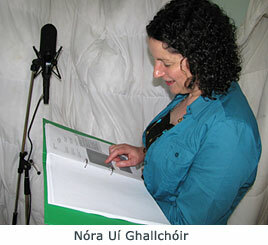 She is from Ard an Rátha, County Donegal, and is assistant editor of Foclóir na Nua-Ghaeilge in the Royal Irish Academy. She teaches regularly in Oideas Gael. Is é Liam Ó Cuinneagáin comhairleoir an chúrsa. Is as Gleann Cholm Cille dó agus tá tréimhse caite aige mar mhúinteoir agus mar phríomhoide scoile i lár chathair Bhaile Átha Cliath. Tá sé ina stiúrthóir ar Oideas Gael ó bhí 1995 ann. Liam Ó Cuinneagáin is an advisor to the course. He is a native speaker from Gleann Cholm Cille, County Donegal. He taught for a number of years as a primary school teacher and was a school principal in Dublin’s inner city. He is the language director of Oideas Gael since 1995. 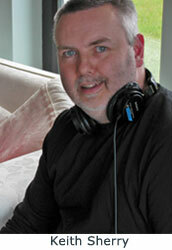 Is é Keith Sherry ó www.soundofvoices.ie a rinne an fhuaim a thaifeadadh. Tá Donal Casey ina mhaisitheoir agus ina chartúnaí. D’oibrigh sé le hEithne Ní Ghallchobhair cheana ar leabhar do pháistí Dhá Chluas Capaill ar Labhraí Loingseach agus foilsíodh cartúin eile dá chuid i mórchuid irisí, Magill san áireamh. Is as Baile Átha Luain ó dhúchas dó agus tá sé ina chónaí i mBaile Átha Cliath faoi láthair. Féach www.donalcasey.com. Donal Casey is an illustrator and cartoonist. 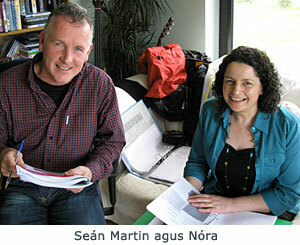 He has previously worked with Eithne Ní Ghallchobhair on the children's book Dhá Chluas Capaill ar Labhraí Loingseach. His political cartoons have appeared regularly in the current affairs magazine Magill and other publications. Originally from Athlone, he currently lives in Dublin. His website address is www.donalcasey.com.